This HII region is ionised by the young NGC 6604 star cluster, which includes the O5-8V+O5-8V+O8I supergiant multiple HD 167971 and the radio source W 35. It lies, unusually, about 70 parsecs above the galactic plane within the Ser OB2 association. Ser OB2 contains over 100 OB stars with a common age of about 5 million years. 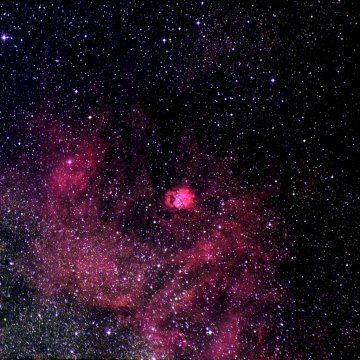 A good image of this nebula, which looks like a nest (Gum 84) carrying a tiny egg (Gum 85), can be seen here. Sh 2-54 is associated with Ser OB2 at a distance of 1900 pc. Ser OB2 contains more than 100 OB stars with a common age of about 5 million years. It is located about 70 pc above the galactic plane. The nebula is prominent at infrared frequencies as can be seen in this MSX image. Avedisova places Sh 2-54 in the star formation region SFR 18.68+1.97 along with three masers, the young stellar object IRAS 18151-1208, and the Wolf-Rayet star WR 113. Sharpless describes a large region, so this nebula would be the large nebula, not just the small bright one within. According to Marsalkova, RCW 167 = Sh 2-54 = Gum 84-85, however Gum states that Gum 85 "Almost lies within [Gum] 84 but this is probably a case of alignment ... They are probably separate objects." Most of the sources used to create these nebula descriptions are listed in the notes section for each description. In some cases, for example the Avedisova, Humphreys and Reed catalogs, the source is used extensively and is not listed in the individual nebula descriptions. See this catalog overview for more information on the catalogs and the general sources used to create these descriptions and this introduction to HII regions on the general history of this area of astronomy. This image was created using the POSS-II/UKSTU data of the Digitized Sky Survey and SuperCOSMOS using the process described here. Use of these images is courtesy of the UK Schmidt Telescope (copyright in which is owned by the Particle Physics and Astronomy Research Council of the UK and the Anglo-Australian Telescope Board) and the Southern Sky Survey as created by the SuperCOSMOS measuring machine and are reproduced here with permission from the Royal Observatory Edinburgh. The Digitized Sky Surveys were produced at the Space Telescope Science Institute under U.S. Government grant NAG W-2166. The images of these surveys are based on photographic data obtained using the Oschin Schmidt Telescope on Palomar Mountain and the UK Schmidt Telescope. The plates were processed into the present compressed digital form with the permission of these institutions. The Second Palomar Observatory Sky Survey (POSS-II) was made by the California Institute of Technology with funds from the National Science Foundation, the National Geographic Society, the Sloan Foundation, the Samuel Oschin Foundation, and the Eastman Kodak Corporation. The UK Schmidt Telescope was operated by the Royal Observatory Edinburgh, with funding from the UK Science and Engineering Research Council (later the UK Particle Physics and Astronomy Research Council), until 1988 June, and thereafter by the Anglo-Australian Observatory. The blue plates of the southern Sky Atlas and its Equatorial Extension (together known as the SERC-J), as well as the Equatorial Red (ER), and the Second Epoch [red] Survey (SES) were all taken with the UK Schmidt. The "Second Epoch Survey" of the southern sky was made by the Anglo-Australian Observatory (AAO) with the UK Schmidt Telescope. Plates from this survey have been digitized and compressed by the ST ScI. The digitized images are copyright ? 1993-5 by the Anglo-Australian Observatory Board, and are distributed herein by agreement. The "Equatorial Red Atlas" of the southern sky was made with the UK Schmidt Telescope. Plates from this survey have been digitized and compressed by the ST ScI. The digitized images are copyright ? 1992-5, jointly by the UK SERC/PPARC (Particle Physics and Astronomy Research Council, formerly Science and Engineering Research Council) and the Anglo-Australian Telescope Board, and are distributed herein by agreement. The compressed files of the "Palomar Observatory - Space Telescope Science Institute Digital Sky Survey" of the northern sky, based on scans of the Second Palomar Sky Survey are copyright ? 1993-1995 by the California Institute of Technology and are distributed herein by agreement. The compressed files of the "Palomar Observatory - Space Telescope Science Institute Digital Sky Survey" of the northern sky, based on scans of the Second Palomar Sky Survey are copyright ? 1993-1995 by the California Institute of Technology and are distributed herein by agreement.